I was hoping to post this sooner, but I am now the mother of a 9 week old puppy, so things have been a bit hectic in my house. Follow Cupcake Crusader, Jenn, and I celebrated our birthday last weekend, and as I’m sure you would guess, our birthday would never be complete without cupcakes. We have to give our Dad four big thumbs up for getting an awesome selection of cupcakes from Nostalgia Cupcakes located in Annapolis, MD. 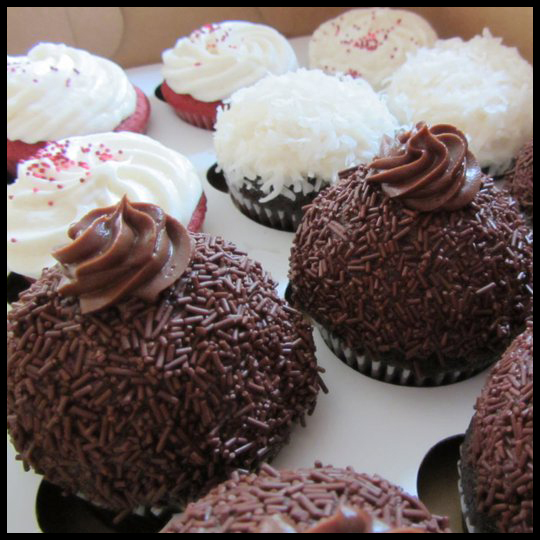 Above: Chocolate City (Semi Sweet Chocolate Cake and Frosting), Coconut and Chocolate, Red Velvet with a Sweet Buttercream Frosting. Above: Strawberry Frosted Yellow Cake with Strawberry Filling, Pina Coloda, “Blue Boy,” Lemon Frosted Yellow Cake, Yellow Cake with Milk Chocolate Frosting. Overall my favorites are definitely the Lemon, the Chocolate Coconut, and the Chocolate City. In close 2nd are the Pina Coloda and the Strawberry. The Blue Boy was okay. It was yellow cake, with a chocolate filling, and dyed blue Frosting. Nothing special. The Red Velvet was just okay too. I prefer a cream cheese frosting on my Red Velvet, so maybe that’s why I didn’t dig it as much? I didn’t even both trying the Milk Chocolate Frosted on Yellow Cake. Boring. Too many fabulous cupcakes and too little time to be wasted on something as common as that. Overall, my dad made some really fantastic selections! I seriously have the best dad in the whole world. I also want to give a big thanks to my family for letting me cut up the cupcakes just to try as many flavors as possible. You all are the best! 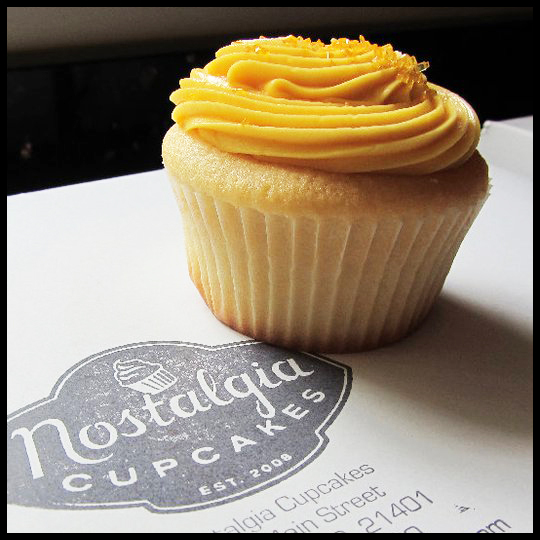 If any of you have a chance to check out Nostalgia Cupcakes in Annapolis, MD, don’t hesitate. Run. Don’t Walk. You will not be disappointed. 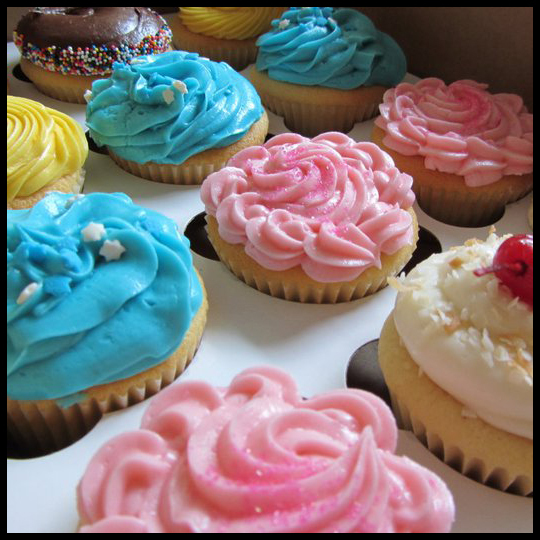 UPDATE: We are sad to say that Nostalgia is now closed after serving Annapolis for 3 years, but you can now get her amazing cupcakes at her new shop located in Bowie, MD, called The Cake Courtesan. This entry was posted in Cupcakes, Maryland and tagged Annapolis, Chocolate, coconut, Cupcake, lemon, Nostalgia, pina coloda, Red Velvet, strawberry, vanilla by Stacy. Bookmark the permalink. oooh these look good. i have yet to have any cupcakes from maryland. love doing cupcake taste tests! Me too! I’m working on my next post from last week when I tried cupcakes from 3 different locations in Baltimore MD. Also, I’m organizing my “2nd Annual” cupcake tour in the Silver Spring/Bethesda (close to DC) area in October. Definitely look out for a blog post about that once that happens. I did a DC tour last year (Georgetown Cupcakes, Hello Cupcake, and Red Velvet Cupcake), I’ll probably post about that just before the tour this year. 🙂 I noticed you are from Kansas? Are there a lot of cupcake places there?